This beautiful diamond flower cross pendant in 14K yellow gold from Apples of Gold Jewelry features seven diamonds at the center of a highly polished, beautiful cross pendant. Measuring 1 inch tall and a little over 1/2 inch wide, this diamond cross pendant will glitter all day and all night, no matter what the occasion may be. The seven diamonds form a flower pattern in the middle of the pendant, and are rathed G-H for color and I1 for clarity, as well as totaling 0.10 carats of dazzle added to this beautiful pendant. "For we walk by faith, not by sight. "(2 Corinthians 5:7). 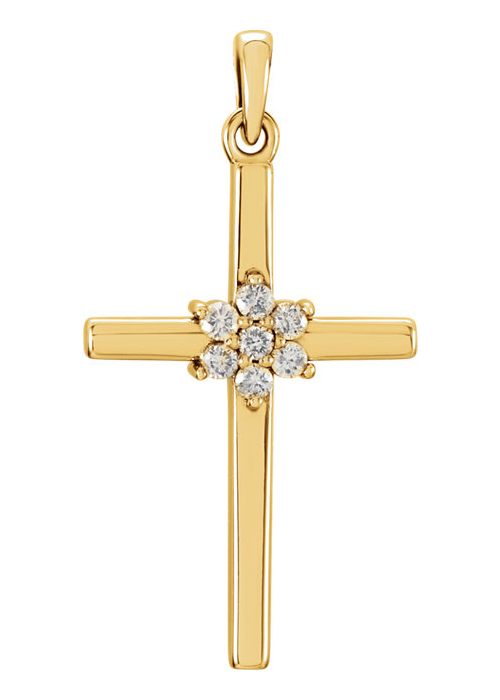 We guarantee our Diamond Flower Cross Pendant, 14K Yellow Gold to be high quality, authentic jewelry, as described above.